There was an earthquake in Japan tonight (tomorrow morning there). Here is the USGS website for this M 6.2 earthquake. 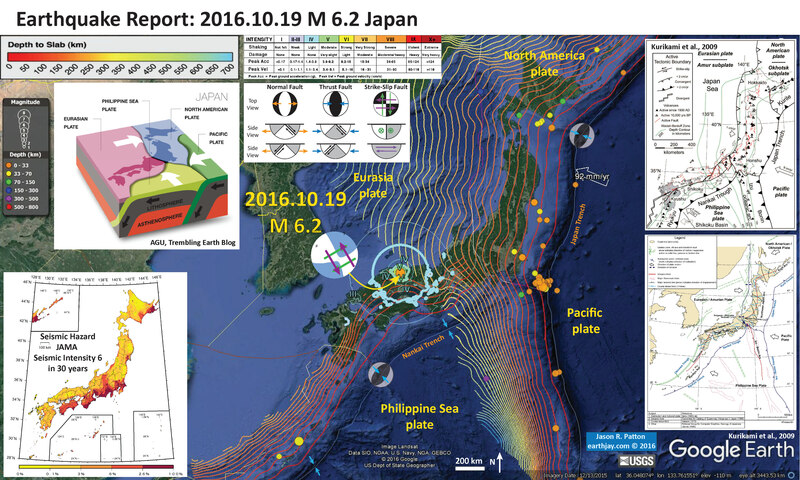 The earthquake was shallow and widely felt with moderate intensity, so some casualties are expected. In the map below I plot the epicenters of earthquakes from the past 30 days of magnitude greater than M = 2.5. The epicenters have colors representing depth in km. The USGS plate boundaries are plotted vs color. The USGS modeled estimate for ground shaking is plotted with contours of equal ground shaking using the Modified Mercalli Intensity (MMI) scale. The MMI is a qualitative measure of shaking intensity. More on the MMI scale can be found here and here. This is based upon a computer model estimate of ground motions, different from the “Did You Feel It?” estimate of ground motions that is actually based on real observations. Today’s earthquake may either be a left-lateral or a right-lateral strike-slip earthquake. There are some faults mapped in the area and seismicity (in map below) suggests this is probably an east-northeast striking right_lateral strike_slip earthquake. 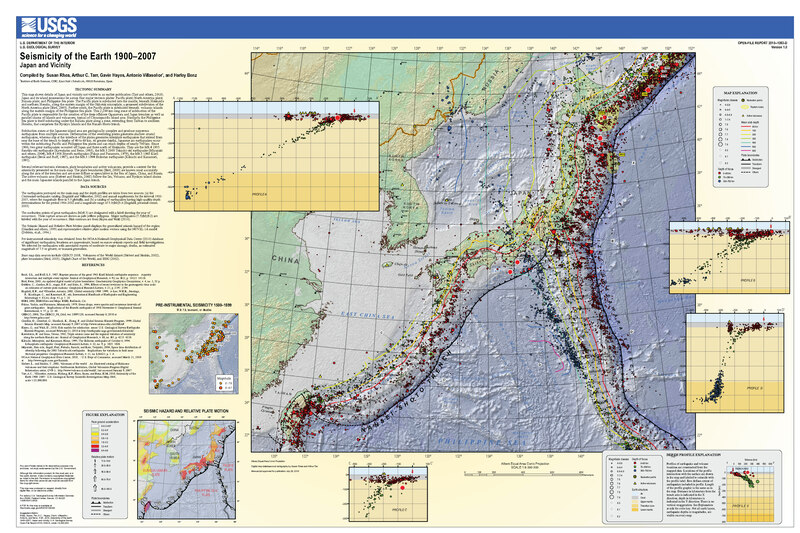 In the right hand of the poster are two maps showing the tectonics of the region(Kurikami et al., 2009). I include these maps below. 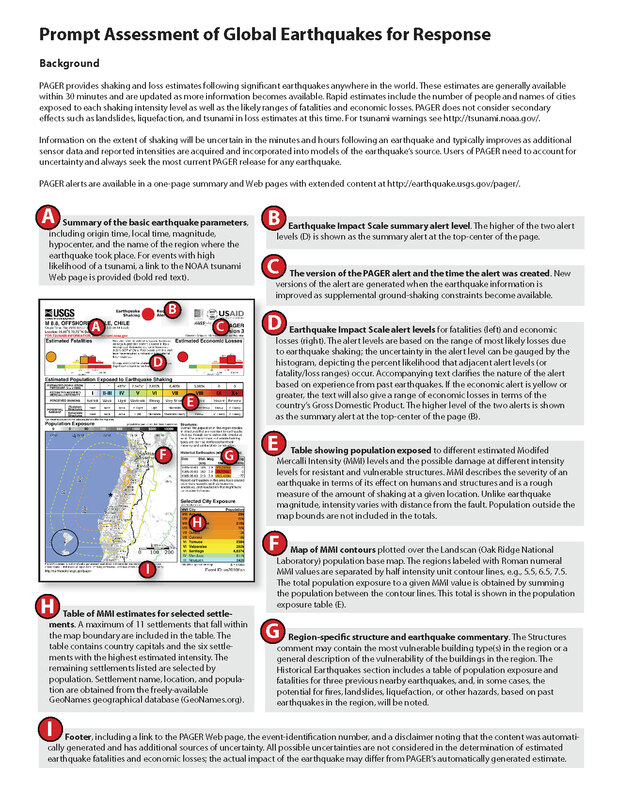 In the lower left corner I place a seismic hazard map for Japan. This map shows the probability of exceedance for ground motion (percent g, where g = gravitational acceleration of 9.8 m/s^2) within the next 30 years. If the ground motions exceed 100% g, then objects can be thrown into the air. 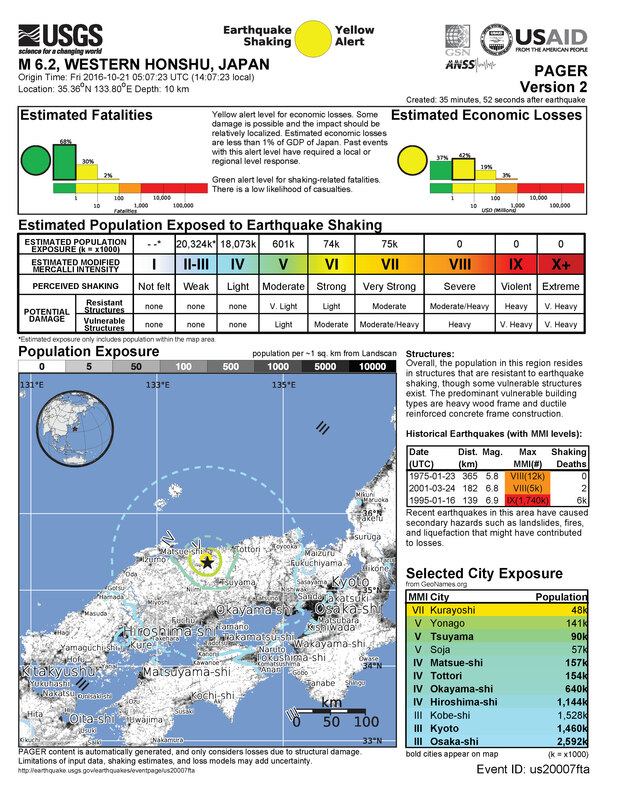 Here is the source of this map, from the Japan Seismic Hazard Information Station (JSHIS). I find it interesting that today’s earthquake is in a region of low seismic hazard. Here is a plot of seismicity (Ohmi et al., 2002). Today’s earthquake plots along the N80W striking seismicity at ~35°30’ (M 6.2 epicenter: 35.358°N 133.801°E). Seismicity in the Tottori and surrounding region. Earthquakes from 1976 until the end of September 2000 from the catalogue of DPRI are plotted. Epicenter of the 2000 Western Tottori Earthquake is shown by a star. Here is the PAGER report, which is an estimate of damages to people and their belongings (infrastructure, like buildings and roads). Here is the USGS web page that explains the PAGER program and how these estimates are made. This poster below explains the PAGER alert page. 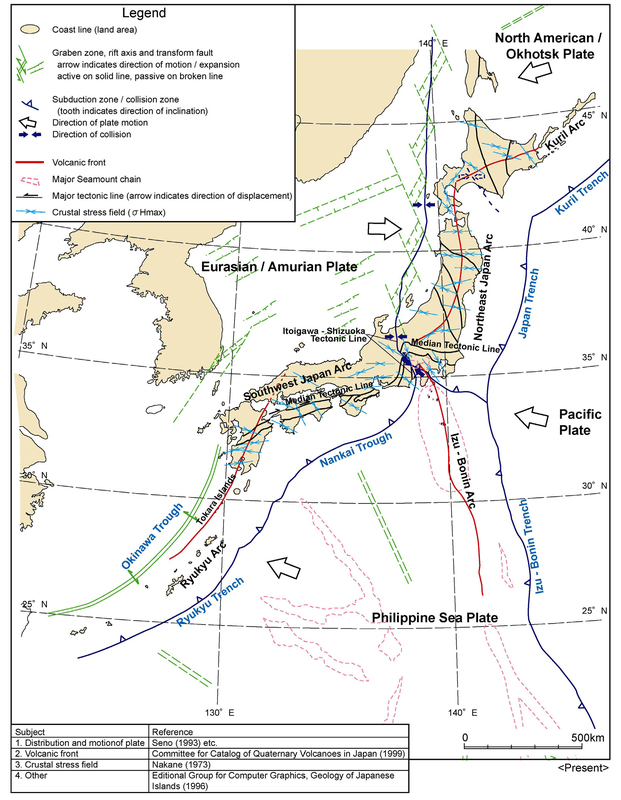 Tectonic setting of Kyushu within the Japanese island arc. 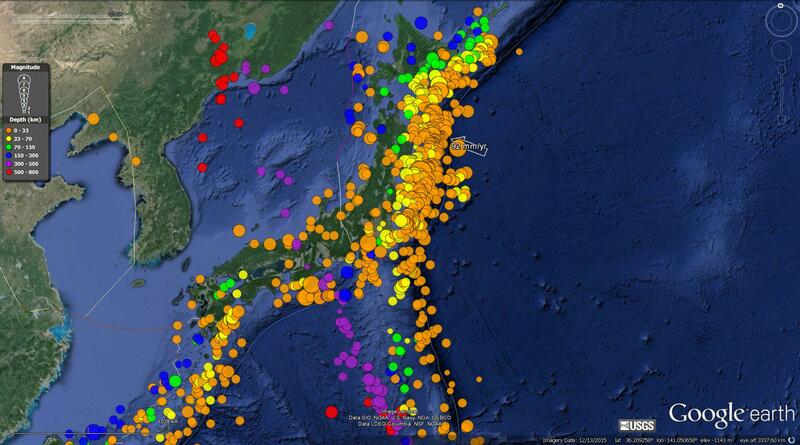 The locations of active faults and volcanoes that have been active in the last 10,000 years are also shown. 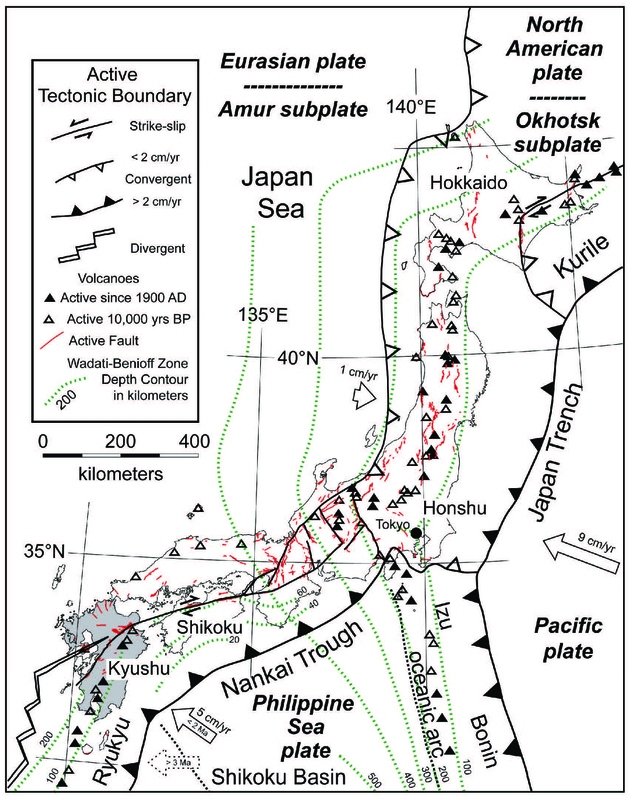 Here is the lower figure showing the tectonic setting (Kurikami et al., 2009). I include their figure caption as a blockquote.